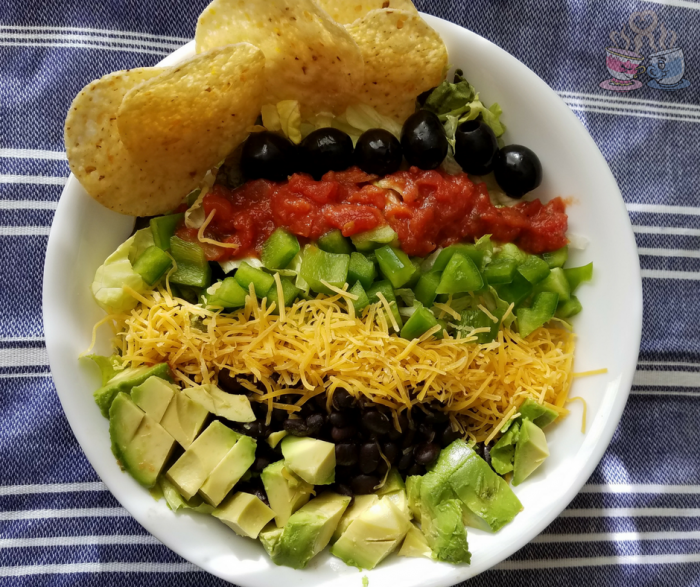 I’m a huge fan of all of the Mexican inspired dishes out there, so this new twist on a Black Bean Mexican Salad Recipe is fast becoming a favorite. I admit I have actually had this for lunch almost every day for two weeks. I just love the combination of flavors and how perfectly it fits into my need for healthier meals while doing Weight Watchers. This post contains affiliate links. I earn a commission through purchased made via these links. I start with cooking my black beans in my mini slow cooker once a week during meal prep. I use the same method as my Crockpot Pinto Beans for those who are interested. I also have a Refried Beans Recipe that can work perfectly in this recipe if you prefer. I love black beans, but you can substitute any bean you prefer. If you aren’t a fan of cooking dry beans from scratch, then simply keep your pantry stocked with a few cans of your favorite pinto beans, black beans, and kidney beans for dishes like this Mexican Salad. Note: I use fat-free cheddar in this Mexican Salad for the sake of saving some Weight Watchers points. I do prefer full-fat cheeses, and more often than not will skip the cheese or use full fat and just account for the extra points in my daily allowance. Do what is best for you and your preferences. Just make sure to count the points if you are doing Weight Watchers. Layer or mix ingredients together as preferred. Mix together until well combined and serve. While this isn’t necessarily a Weight Watchers Salad Recipe, it is easily used as one. It has simple flavors with tons of fiber and nutrients. The black beans are a great source of lean protein in this Mexican salad recipe. Black olives and avocado are both favorite healthy fats that I like to use regularly. 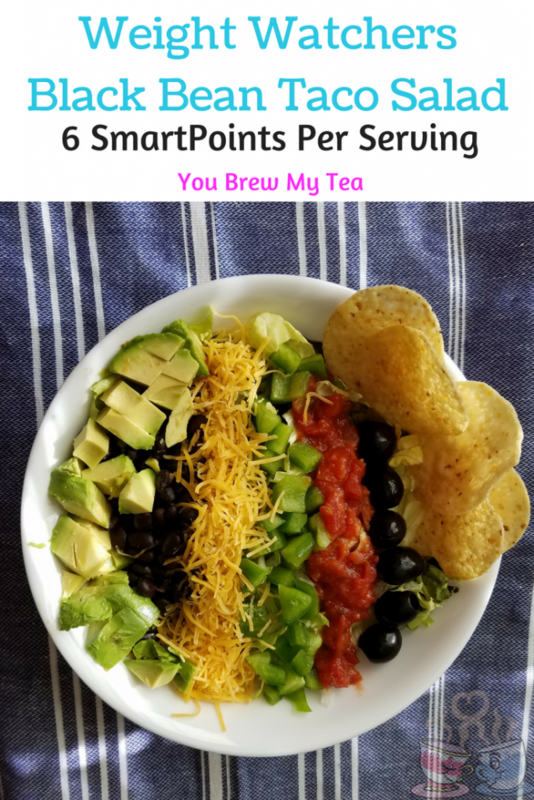 If you are wanting a larger serving, you can easily eat both portions for 11 SmartPoints (yes, that is how it is calculated in the recipe builder). Alternately, you could skip the avocado and black olive or chips for a lighter version. If you aren’t a Weight Watchers member, but want to use he program, feel free to join my SmartPoints Support Group on Facebook, as well as pick up a Weight Watchers SmartPoints calculator on Amazon to get started. If you are currently following the Weight Watchers plan, I have a few great tips for making salads more enjoyable. Most of these additions add no points or just 1-2 points per serving. For me, that extra 1-2 points makes it well worth it when I feel satisfied. I love loading up salads for lunch since they can satisfy me for fewer points leaving me room for an afternoon snack or dessert after dinner. Use salsa, avocado, or lime as a dressing instead of bottled varieties. If you must have dressing use Bolthouse Greek Yogurt blends, OPA, or Walden Farms for lower points values. Prep vegetables in advance once per week so assembling your salad takes only 2-3 minutes instead of a half-hour of prep. I am pretty sure this Black Bean Mexican Salad is going to be a favorite of yours just like it is mine. If you want to prep ahead like I do, check out these great 2-compartment meal prep containers. They stack perfectly in the fridge, and they are perfect for a serving of this salad. I love these! This one has not been updated for FreeStyle yet. This is the Beyond the Scale SmartPoints.